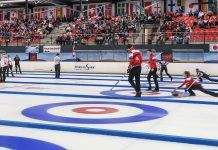 Team Canada has opened the women’s curling competition at the 2015 Winter Universiade in Granada, Spain, with a pair of of victories. Team Canada lead Jessica Armstrong delivers rock to sweepers Lynn Kreviazuk and Lauren Horton during Day 1 action on Thursday in Granada, Spain. Breanne Meakin’s Ottawa-based team — third Lauren Horton, second Lynn Kreviazuk, lead Jessica Armstrong and coach Doug Kreviazuk — opened the 10-team round-robin competition on Thursday at the Fuentenueva Pavilion on the campus of the University of Granada by beating South Korea’s Kim Eun Jung 6-4, and following up with a 10-2 triumph over Japan’s Mayu Minami in the evening draw.